My hutch makeover is finished! And I love it. My first ever milk paint project is a success and I am so happy! She is white grey, striped, and lovely. It was a hell of a job, and I had my moments, but she turned out exactly as I intended and envisioned from the start. I hadn’t realized how long it has been since I did a proper furniture makeover. But now that this is done this is by far my favorite furniture painting project so far. The power of paint rocks! I had so much fun, figuring out what to put in her and where. I put my mom’s China back in, although not all of it. Just enough to have a little tea party with it. I decided to keep all the dinner plates and bowls in storage for now. We hardly use them and it took over the hutch when I put it all in there. This is good too. I don’t need all 200+ pieces to remember the good times, I just need a few that I will actually use once in a while. This hutch is the first thing I see when I walk into the room. And the whole room feels so much lighter and airier now. That big, dark wooden hutch really overpowered the room. Do you remember what she looked like? What a difference some paint makes…….. I still have faith summer will arrive (still cold and wet over here in the low lands), so I summered up the shelves. She looks white, but she is actually a very light grey. Miss Mustard Seed grainsack grey to be exact and the stripes are shutter grey. I love that she changes color as the light hits her. Depending on how the sun is shining into our room, she moves from darkish grey to warm white. And the stripes change from light to dark grey to almost blue. Love it! I did not only paint her, I added two more shelves too. The man didn’t see it, and I had to fight him over this, which was funny. He totally gave me free range on painting this thing, and when I said I wanted to add some glass shelves, he objected. I did it anyway. I saw it in my mind and I knew it would be beautiful. There is a special place now for the decorative glassware we inherited from my in-laws. It looks so much better now that it is actually visible on those extra shelves. I reached out to Marian herself too. I was starting to panic a bit at one point. But she set me straight, gave me some more tips, said she had faith in me and to be assured that ‘the ugly phase’ would pass. Now photographing her was a totally different story. The glaze in the windows is crazy and the inside looks much darker than it really is. I see another photo session in my future, because I don’t feel I have done her justice. I have been gazing at her all day yesterday, and smiled a big smile when I walked in this morning. Seeing her made this Monday morning so much better than most Monday mornings…. Wat een verbetering, veel minder massief zo! Echt een plaatje! Gaaf ook die donkerdere streep aan de binnenkant! You just made my day! Prachtig! she is beautiful….what more can I say? I would be so proud and chuffed with myself if I were you. Wát prachtig! Echt zoveel mooier dan voorheen. Vraag jij je dan ook af, waarom je dat niet veel eerder gedaan hebt? 🙂 Ik wel; ik heb kortgeleden onze keukenkast geverfd en ben er ook nog iedere dag blij mee. Mooie details ook: de doorgeschuurde randjes en die grijsblauwe baan aan de binnenkant. Je mag trots zijn op jezelf!! The hutch is beautiful! Also love the glass shelves and styling. 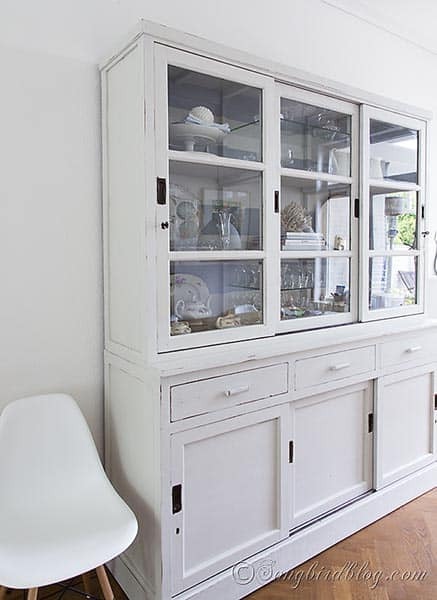 A hutch is a huge undertaking–well done! Aaaaaach! De kast is prachtig geworden. Als ik maar wist waar ik de moed kan halen om zelf te beginnen. You did a beautiful job! I noticed the two glass shelves immediately and thought they added another interest to the piece. I enjoy seeing your knack for creating beautiful vignettes. I have to admit I had my doubts when you posted that you were going to paint it but the results are stunning! Isn’t milk paint fun? I love how it has a mind of it’s own and when you just “go with it” the results are always unexpected loveliness! Absolutely beautiful! It has a summery nautical feel Marianne. Love it! Absolutely stunning! Your home does white so well! Love the aqua beach glass pieces.. swoon! It turned out beautiful! Like a breath of fresh air! Stunning…..Great job! and I love how you were picky about what went back in….Have a great week! I love your hutch. I’d love to find one just like it. 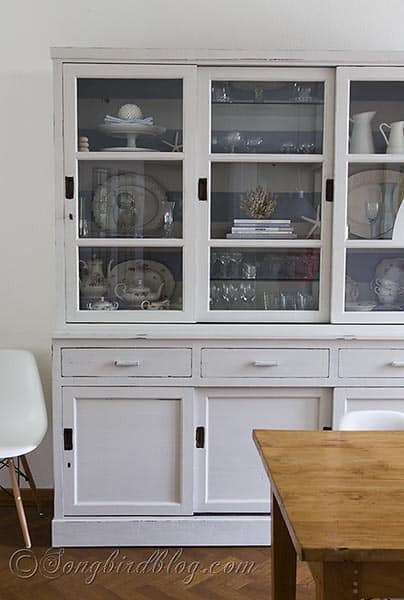 I’ve been searching for a larger china hutch for awhile now. I followed a link from Not Just a Housewife to see it! Wow, dat ziet er totaal anders en heel erg goed uit! Petje af, Marianne! I love what you did with the stripes in the back of yours! What a nice pop of color 🙂 And I LOVE your floral teacups and china. I am so glad I found your site! What you achieve is very inspiring to me. Even if I fail to lift a finger, I am still enjoying reading about your “adventures”. Thanks!!!! This turned out beautiful! Thank you for sharing! You did an incredible job. What a transformation! Thanks for sharing at DIYbyDesign. Glad to have you join the party. It came out wonderfully! I’m so glad you stuck it out and didn’t give up! I followed your angst on the retailers page and was looking forward to the result! Fantastic!! That looks perfect! I bought some milk paint but haven’t used it yet – waiting until I have the time to really do it right 🙂 Love! This turned out SO beautifully Marianne! Although the before was beautiful, I tend to lean toward the lighter, brighter look myself. Hutches are such a bear to paint and you did a fantastic job! Soooo Pretty! I love how you added the interior stripes to this amazing piece… it brought it to a whole new level! I am adding this idea to my “Future bag of tricks”! Sharing your cleverness on FB! Oh my gosh this is stunning! I adore the stripes and every single thing you have displayed. Well done! You got yourself a totally new piece and I LOVE it! Well done! The stripes, the styling… beautiful! 1. what would you say was the hardest part? 2. How much MMS MP did it take to do that hutch? I want to make sure I have enough on hand before I begin! 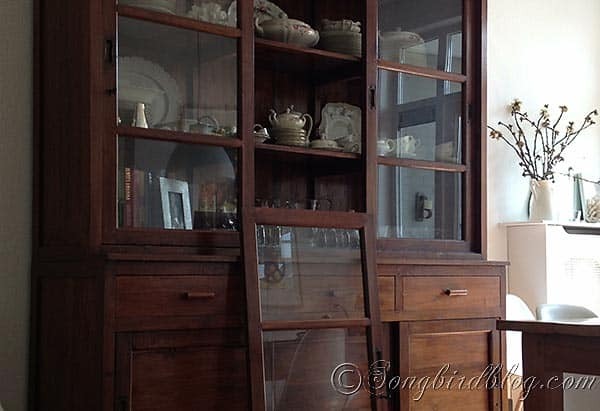 What a wonderful hutch makeover, Marianne! I think it turned out gorgeous! I can’t wait to try her milk paint… hopefully this summer!